The line which has received the title of the Ring of Solomon is a small line rising between the fingers of Jupiter and Saturn, running downward and encircling the Mount of Jupiter, and ending near the beginning of the Life line (544). It is an indication of a love for occult studies, and of an ability to obtain proficiency in them if other necessary Chirognomic indications be present. 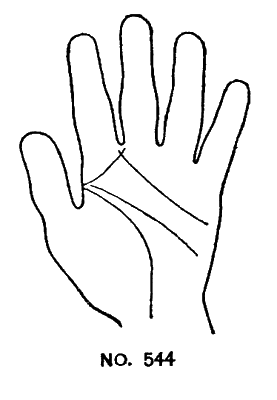 It is most often seen in a much lined hand, and generally a Croix Mistique is also found in the quadrangle. I have seen many subject with this marking who have developed great aptitude for occult studies and none in whose hands I have noted it have ever been lacking in a fondness for Psychology. The great raying and lining present in most of the hands in which I have seen it would of itself indicate great impressionability and numerous emotions, and such subjects are always interested in new things. The Ring of Solomon by itself, however, must not be taken as a sign manual of proficiency in the realm of occult thought. It is only an indication which should draw your attention in this direction. Before committing yourself to any extent on the occult powers of the subject, see if a good brain and other necessary adjuncts be present. See if energy, ability to study, and perseverance are indicated. Dreamy idlers who rely upon inspiration or revelations from on high, and not upon good reasoning, compose only the cranks in the field of occult studies. Even a good Ring of Solomon will not rescue such from the multitude of those who have done nothing but talk. People who have accomplished much in the psychic world have square or spatulate tips with knotty joints, and their success has been largely due to hard study and the application of good reasoning. The presence of a Ring of Solomon will help all of these students. The kind of subject on which it is seen must, however, be the guide in reading this line. Straight Ring of SolomonA straight Ring of Solomon. When the line is flat and straight, it shows that logic is used to find the truth in others. If you have this flat type psychic line, trusting the first impressions on what you think about a person will usually be accurate. 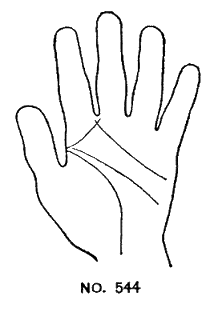 Welcome to Palmreading-Tips.com a premier place on the internet to find all the interesting information about the ancient Art of Palmistry and lots more related to them, Just aim to make you easily learn and understand, so that you can get most out of your life. ©2010 All other Brand Names, Logos & Information presented here, are properties of their respective owners.